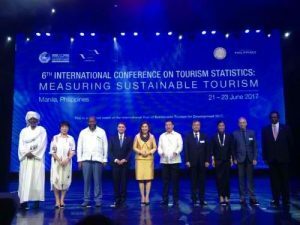 Manila (Philippines) – August 1, 2017 (travelindex.com) – Nearly 1,000 experts from over 80 countries convened for three days (21-23 June) in Manila, The Philippines at the 6th International Conference on Tourism Statistics to lay the groundwork for an expanded statistical framework to measure sustainable tourism in its economic, social and environmental dimensions. The outcome “Call for Action on Measuring Sustainable Tourism” represents a global commitment to sustainable tourism and the need to measure it through a consistent statistical approach recognizing that effective sustainable tourism policies require an integrated, coherent and robust information base. “The Manila Conference constitutes a milestone for tourism measurement, not only by extending the current statistical standards beyond their economic focus to cover the social and environmental dimensions, but because it represents a global commitment to sustainable tourism and a recognition of its contribution to the 17 Sustainable Development Goals (SDGs) of the universal 2030 Agenda for Sustainable Development” said UNWTO Secretary General Taleb Rifai. The Manila Call for Action reflects the collective vision and commitment to collaborate on the further development and implementation of a Measuring Sustainable Tourism (MTS) statistical framework. The document will be formally presented by the Secretary of Tourism of The Philippines, Mrs. Wanda Teo, to the UNWTO General Assembly, taking place in Chengdu, China, this September. Sustainable tourism is understood as tourism that takes full account of its current and future economic, social and environmental impacts, addressing the needs of visitors, the industries, the environment and host communities. As such it is a continuous process and requires constant monitoring of impacts. The Conference is part of the process to develop a framework to measure sustainable tourism, and builds upon and expands the two official UN statistical standards for measuring tourism adopted in 2008: the International Recommendations for Tourism Statistics 2008 and the Tourism Satellite Account: Recommended Methodological Framework 2008. The Measuring Sustainable Tourism (MST) initiative has received full support of the United Nations Statistics Commission and is geared towards shaping and sharing a common understanding of how to measure the economic, environmental and social aspects of tourism across relevant spatial scales – global, national and subnational levels – while incorporating the possibilities opened by technological advancements and continuing to advocate for the sustainability principles of our sector.